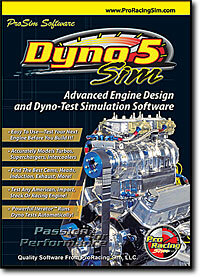 Product Summary: Nearly 20 years of continued software development is the reason DynoSim5 has become the first-choice among serious engine enthusiasts worldwide. If you want to get the most from your next engine project, the powerful features of DynoSim5 with ProTools will help you optimize performance while keeping costs down. Version-5 includes hundreds of new engines, advanced forced-induction modeling, ignition modeling, combustion modeling, rocker-ratio math, expanded results graphs and tables, comprehensive printouts, full compatibility with other Version-5 simulations, automatic updating over the web, and much more! Put the latest in Sim technology to work for you today.